Sewists use, as one of their primary tools, a large number of pins. These pins are for holding fabric in place temporarily so that adjustments can be made before it is sewn together. When not in use, however, these pins are generally placed in a box somewhere or stuck into a pincushion. For a sewing accessory that most sewists use on a very regular basis, it’s nice to get the opportunity to create a personalized pincushion, or even to make something that isn’t just a rounded stuffed ball. Pincushion Appeal: Patterns for Pincushions to Make You Smile, by Cecile McPeak and Rachel Martin, is a book of eight pincushion sewing patterns that, as the title suggests, will make you smile. Each of the included pincushions is something unique and interesting, like a smiling whale, a cactus, a bird in a nest, and even a bride and a groom (in the style of cake toppers). For each of the included patterns, McPeak and Martin include a list of all materials needed and a fully descriptive step-by-step list to follow along with. Templates for each part of the fabric pieces needed are also included for each project. 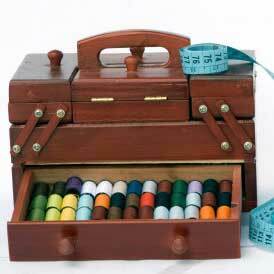 Pincushion Appeal also includes a small introduction to sewing, with reference to these specific projects. Instead of having to go over the same specifics (seam allowance, how to cut each fabric piece, etc.) for each of the projects, each of those steps is outlined in the beginning, all at once. There is also a full color photograph of each finished pincushion accompanying every pattern. Pincushion Appeal is perfect if you’re looking to make a special gift for that dedicated sewist in your life, or if you just want to make your own variety of cute pincushions. All of the included projects are beginner friendly, and none of them take very long to make since they are all so small. We did not receive compensation in exchange for this review. Items received are used for product review and testing. All opinions are those of the editorial staff. Our Disclosure Policy can be found here. Chance to win a copy of Lunch Hour Embroidery!